I think it's fair to say that hadn't it been for the 60s/70s masala beat and funk stuff, Burman and Kalyanji Anandji et al., I wouldn't have been as much into Bollywood soundtracks as I arguably am. But I'd still have been a fan of Geeta Dutt; with all due respect to Asha and Lata, she's my favourite of the female playback singers. So when a vintage O.P. Nayyar score comes along which has her singing on all but one of the tracks, odds are I'm going to like it. And I do. 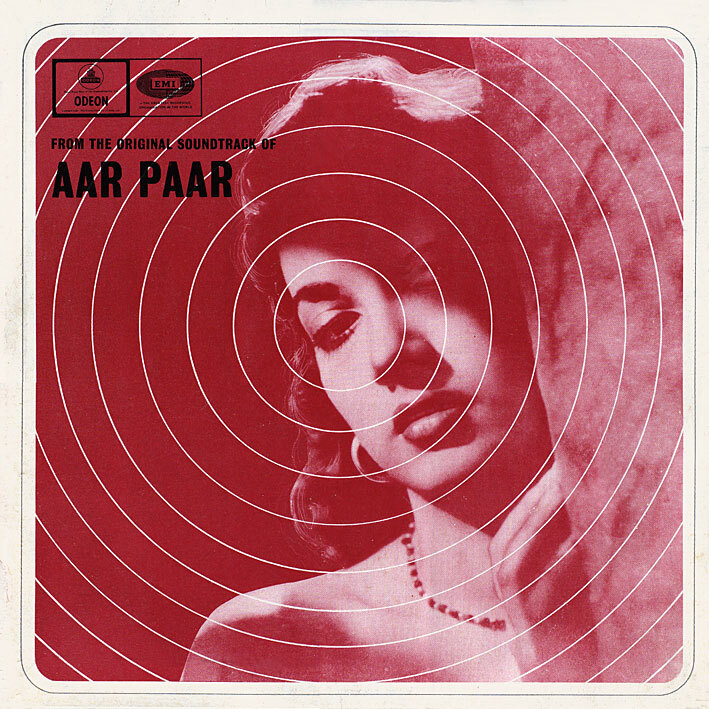 'Aar Paar' is a lovely album, packaged in a gorgeous sleeve. Soothingly sweet melodies and subtle rhythms all around; 'Hoon Abhi Main Jawan', 'Sun Sun Sun Sun Zalima', 'Babuji Dheere Chalna' and 'Ye Lo Main Haari Piya'... tonics for jaded ears, the lot of them. You can't ask for more than that. Hello PC, I have been following your blog for some time and have auditioned some of the rips. I must say they are excellent rips from Indian vinyls. May I request you to share how you are achieving such clean sounding rips, what equipment and software you use for ripping, cleaning/equalizing and then encoding? I think it will be of great value to a lot of vinyl fans who wish to preserve their treasures in this digital era. Thanks in anticipation. I've received (and answered) this request several times before... there are loads of ways of doing it, depending on your platform and set-up. A quick google search should lead anyone interested to one that's suited. Primarily though, I try only to buy records that have been taken well care of. It is an excellent film too :) Thanks PC! It looks nice, from the clips. You've not reviewed it though, have you? I use an old Stanton turntable, connected to an iMac. I record using Sound Studio (from www.felttip.com) and clean/tweak using either that or and old version of Roxio Software's Spin Doctor.